One of the very few opportunities to see the band in a public event, we invite you to come to this wonderful event in Cambridgeshire. Childerley Long Barn is delighted to announce Taste at Childerley 2014. 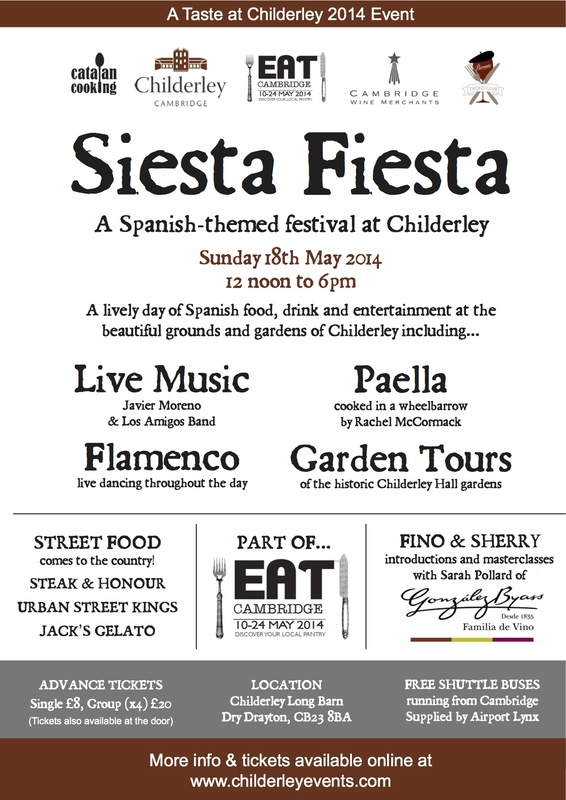 In partnership with Cambridge WIne Merchants, you are invited to enjoy the rich variety of authentic cuisine, wines, flamenco, and Fino, as Childerley Long Barn is transformed into a lively Spanish Fiesta for all the family. Join a tutored tasting or masterclass with sherry experts from Cambridge Wine Merchants; buy a picnic from the food stalls and take a siesta in the beautiful grounds; or make a day of it and soak up the party atmosphere of a true Spanish Feria. Mini Bus shuttles will transport you in style from Cherry Hinton Road and Bridge Street branches of Cambridge Wine Merchants kindly provided by Airport Lynx. This is the new look of our new website/blog, where we will update you with the latest performances and news. We are happy to announce that most of our Saturdays are fully booked pretty much from now on until August, although some dates or afternoon/evening slots are still available, please do get in touch if you would like to make an enquiry for your summer BBQ, wedding or party.